Brown sugar balances the tartness of the lemon in this popular lemon chicken dish. 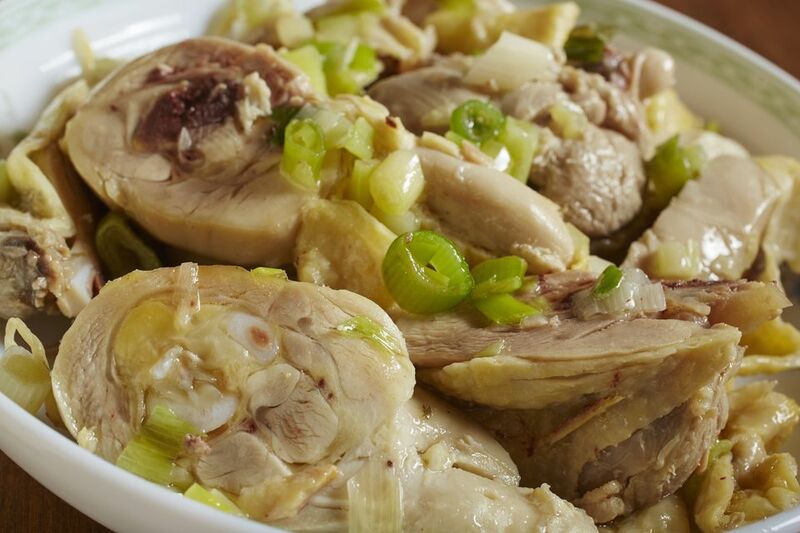 The chicken is steamed with soy sauce, dry sherry, and ginger. Combine the marinade ingredients. Place the chicken in a bowl with the lemon juice. Add the marinade ingredients and sprinkle the ginger pieces over the chicken. Marinate the chicken for about 20 minutes. Steam the chicken. If using the wok to steam the chicken, place the chicken on a steam proof dish and pour the marinade ingredients over it. Steam the chicken until it turns white and is cooked through. If using a commercial steamer, prepare according to the steamer directions. Depending on the type of steamer, you may not be able to pour the marinade over the chicken before steaming. If that is the case, reserve the marinade and steam the chicken according to the manufacturer's instructions. Bring the reserved marinade to a boil and pour over the chicken just before serving. Serve hot with rice and stir-fried dried mushrooms. Garnish with green onion and lemon wedges.